The final scene of ‘The Sopranos’ is one of the most polarizing moments in television history, so let’s take an in-depth look at The Sopranos ending. This final scene has left many viewers feeling cheated. Like much of seasons five and six, it’s full of dead ends that are meant to make us nervous, but don’t actually mean anything. The scene features the Soprano family sitting down to a casual dinner together. It’s a scene of quotidian charm and family warmth – except that it’s punctuated with suggestions of assassination. Like any good criminal, Tony knows never to sit with his back to the door. He sits facing the door of the restaurant, watching for his family and also for adversaries. As the Soprano family sits down for dinner, the camera lingers on a random customer at his seat, on a guy in a Members Only jacket, on a pair of men at a display counter – making the viewer feel suspicious of all them. The most egregious example of the dead ends in this scene are the labored shots of Meadow trying to parallel park her car. In earlier seasons of The Sopranos, the show was capable of using one element to accomplish many things at once: the talking fish in the ‘Funhouse’ episode was symbolic of Tony’s subconscious, it furthered the story, and it was a reference to The Godfather (read our full analysis of The Sopranos dreams). Meadow parking her car is the opposite of that. It’s one-dimensional. It serves to ratchet up the tension of the scene because it’s frustrating to watch, but otherwise, it has nothing to do with the story and it feels hollow. In one of the last shots of The Sopranos, the guy in the Members Only jacket enters a bathroom. Fans of The Godfather will be reminded of the moment when Michael Corleone retrieves a gun from a restaurant bathroom before murdering a rival mobster and a cop. David Chase says he was aware of that connection too, calling that scene from The Godfather “iconic.” However, the final shot of the scene is not a shot of Tony being murdered, it’s just a moment of blackness and silence. The Sopranos Ending: Does Tony Soprano Die? The most popular theory about the final moment of the show is that in the moment of blackness, we are seeing from Tony’s point of view. In other words, throughout the scene we see the restaurant door from Tony’s eyes, and now we are seeing as he sees in death: which is total blackness, or nothingness. 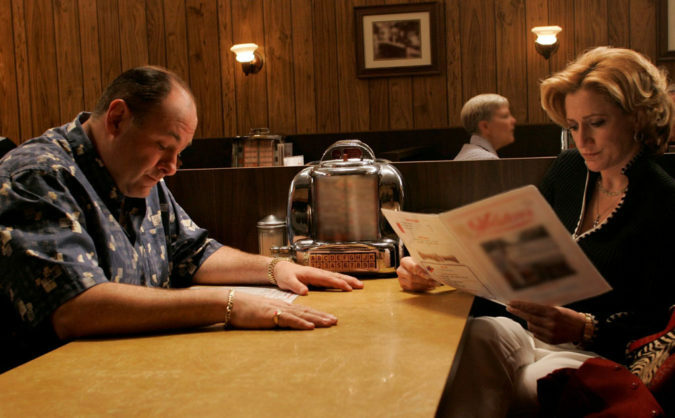 David Chase has discussed the final scene in depth, but he remains ambiguous on the last shot and whether or not he agrees with the interpretation that this moment is Tony’s death. There’s no getting around this one simple fact: we do not see Tony Soprano die in the last episode of ‘The Sopranos.’ We don’t see or hear him getting shot. What we do get is a moment of blackness – but the primary effect of that shot is that it has left millions of Americans feeling confused. I watched this episode when it aired live in a bar that was crowded with viewers; we were all silent on the edge of our seats watching the show. There was an uproar in the final moment because we thought the cable had gone out! That last moment feels like a mistake the first time you see it. If the primary effect of the last shot of your show is confusion, then you’ve made an error. David Chase succeeded in making a final scene that is full of tension and has encouraged debate. The entire Sopranos ending scene is incredibly frustrating – and the final moment of blackness feels like an overly artsy idea that was out of character for the show, and ultimately feels like a mistake.